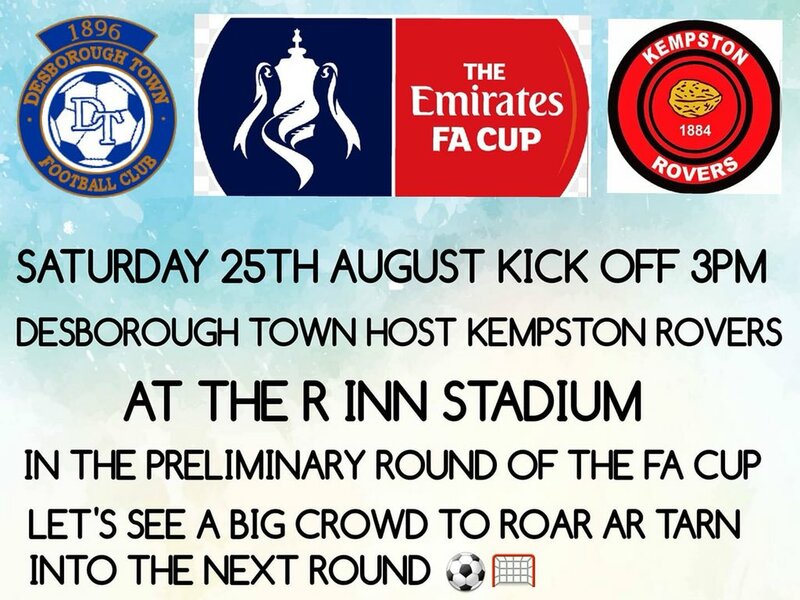 The Road to Wembley started for many teams up and down the country this weekend in the world's greatest cup competition as the Emirates FA Cup started at the Extra Preliminary Round. This game saw Arlesey Town of the Spartan South Midlands League Premier Division (Step 5) face Desborough Town of the United Counties League Premier Division (Step 5) and a repeat of last season's Preliminary Round tie which the Bedfordshire side won 3-1. Arlesey have a impressive recent history in the cup having got the first round proper in 2011 where they were beaten by Salisbury City and 2012 when they lost to Coventry City. Desborough Town have reached the first round proper but it was a little while ago in 1926 when they played then Division Three (North) Doncaster Rovers - the original game was all square when it was called off due to fog with eight minutes left with Rovers winning the re-arranged game 3-0. Arlesey Town had been relegated from the Southern League at the end of the 2017/18 campaign and have a new management team of Matt Endersby and James Hatch for this season - going into this game they had made a great start beating London Tigers 2-0 at home and Baldock Town 'away' 0-1 having a 100% winning record. The 'away' game was played at their New Lamb Meadow home where Baldock currently ground-share. Desborough Town, managed by Chris Bradshaw and Lee Duffy, had draw 1-1 at Eynesbury Rangers before beating Kirby Muxloe 5-1 at home in their opening games. They were backed by a good number of fans who had made the trip from Northamptonshire to back 'Ar Tarn' as they are nicknamed. It was the visitors who looked the better side at first with Lamar Parkes and Ty Clarke looked good going forward. Desborough took an early lead (which caught me out on camera duties) when a mistake in defence for Arlesey let Parkes score from close range. As the game went on the home side got back into it but it was the away side who still looked the better going forward. Arlesey battled on and were able to make it 1-1 just before the break when a ball across the box was tapped home by Lorrell Smith. In the second half Desborough were unlucky not to make it 1-2 when Jordan Henderson hit the post from a header at the edge of the six yard box and it all looked like it was not going to be their day as Arlesey scored again from close range through Lorrell Smith netting his second. It was a double dose of bad luck as Lamar Parkes (who had been their best player up to this point) went off after picking up a knock in the build up to the goal. Luckily he was replaced by former Aston Villa, Northampton Town and Walsall youth player Merdy Maki who was a real thorn in the right hand side of Arlesey for the rest of the game. Maki got the ball down well and just went forward with lots of close control and skill - he looks a great player from what I saw yesterday. It was 2-2 when Desborough went through with the home fans, home players and home management shouting for offside for Ty Clarke to score and then only a short while later it was 2-3 when poor defending from the home side allowed three players through and Jason Turner to score. Maki was linking up well with Dan White in the centre of midfield and it was the same combination that made it 2-4 when Maki drew in a number of defenders with a nice run across the edge of the box allowing White to curl a fantastic shot right into the top corner from outside of the box - Robbie Ponting in the Arlesey goal had no chance. It was class goal which has been viewed on twitter over 7,500 times at the current time of writing! Despite Arlesey scoring via Ash Fuller to make the score 3-4 Desborough looked comfortable and the victory never looked in doubt for them. It was a memorable day for 'Ar Tarn' and they will look forward to facing Kempston Rovers at home in the next round of the competition. Arlesey Town's next game comes in the league at Hadley next weekend with Desborough Town hosting Deeping Rangers next weekend before their big FA Cup game on Saturday 25th August.